Woodlore® is made from wood composite MDF utilizing 95% of the tree. Denser than plywood or chipboard (the resins are heavy). Low grade MDF may swell and break when saturated with water. May warp or expand if not sealed. May release formaldehyde, which is a known human carcinogen and may cause allergy, eye and lung irritation when cutting and sanding. Dulls blades more quickly than many woods. Use of tungsten carbide edges cutting tools is almost mandatory, as high speed steel dulls too quickly. Though it does not have a grain in the plane of the board, it does have one into the board. Screwing into the edge of a board will generally cause it to split in a fashion similar to delaminating. Subject to significant shrinkage in low humidity environments. Trim (e.g. baseboards) comes pre-primed, but this is insufficient for fine finish painting. Painting with latex paints is difficult due to rapid water absorption. Most finishes appear uneven and nail holes tend to pucker. wood core. We employ only the finest MDF materials and technology. UV inhibitors protect against color fading and yellowing. of environments. They resist cupping and warping, ensuring a tight closure and smooth panel and louver operation. Air conditioning accounts for approximately 45-65% of a single- family dwellings monthly utility bill. Windows can account for 11-24% of this amount. Experts estimate that 20-30% of the summer heat can soak through your windows if not properly insulated. With energy cost ski rocketing, you will appreciate the products that will conserve energy. 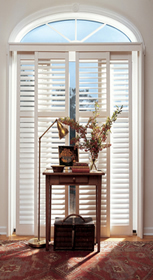 Shutters will provide the insolating factors to save your money.